The Bureau of Reclamation and Department of Water Resources systematically drained northern California reservoirs last summer, resulting in low flows and endangering salmon and steelhead in the Sacramento, Feather and American rivers, while filling water banks and Southern California reservoirs. Last summer, high water releases down the Sacramento, Feather and American rivers left Shasta, Oroville and Folsom reservoirs at dangerously low levels. Shasta is at 36 percent of capacity and 54 percent of average; Oroville, 36 percent of capacity and 54 percent of average; and Folsom, 17 percent of capacity and 34 percent of average. 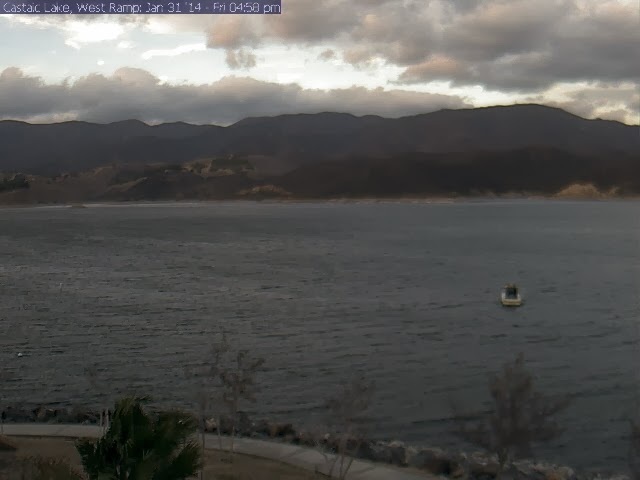 Castaic Lake as of Friday, January 31, 2014. Yet Pyramid Lake in Southern California is at 98 percent of capacity and 105 percent of average, while Castaic Reservoir is 86 percent of capacity and 105 percent of average. The state and federal water agencies exported massive quantities of water to agribusiness interests and Southern California water agencies, endangering local water supplies and fish populations as the ecosystem continues to collapse. Bill Jennings, Executive Director of the California Sportfishing Protection Alliance, explained how the water was mismanaged. “We entered 2013 with Shasta, Oroville and Folsom reservoirs at 115 percent, 113 percent, and 121 percent of historical average storage. In April, they were still at 101 percent, 108 percent and 96 percent of average," said Jennings. "With no rainfall and little snowpack, the Department of Water Resources and the Bureau (of Reclamation) notified their contractors that water deliveries would be reduced. But they didn’t reduce deliveries. Instead, they actually exported 835,000 acre-feet more water than they said they would be able to deliver," said Jennings. Ironically, the Metropolitan Water District of Southern California will have enough water in 2014, 2015 and 2016 to supply its users while Sacramento, Folsom and other cities have been forced to cut water use by 20 percent. “We’ll have plenty of water in 2015,” Jeffrey Kightlinger, Metropolitan’s general manager, told the Sacramento Bee. “And even if it’s still a drought, we’ll still have enough water in 2016." Jennings said the present crisis could have been avoided, and is a "direct result of egregious mismanagement of the state’s water supply system by the state and federal water projects." "Excessive water exports and the failure to prepare for inevitable drought have created a decades-long disaster for fisheries, and placed the people and economic prosperity of northern California at grave risk. The State's obsession with tunneling under the Delta does nothing to address drought, or put us on a path to correct the misuse of limited water supplies," he added. The proposed peripheral tunnels will undoubtedly kill the sensitive Delta, a delicate mix of salt and freshwater, that is vital to the life cycle of Central Valley Chinook salmon, as well as thousands of other fish and species, according to the Winnemem Wintu Tribe. John Herrick, Restore the Delta board member and Counsel and Manager of the South Delta Water Agency, said the failure of the state and federal water projects to plan ahead contributed to the current water shortage. "Last winter and spring the projects were concerned about not having enough water to meet fishery or agricultural standards, and so sought changes in their permits to allow for the relaxation of those standards," he said. “At the same time, they projected the amount of water available for export. As soon as the projections were released, they began to pump MORE water than they projected; thus taking the water needed for fish and endangering future allocations for all purposes. If this had not been allowed, the reservoirs would have 800+ TAF more storage in them than they currently do,” he noted. “The Urgency Petition process is for actual, unforeseeable emergencies,” said Herrick. “The State has known since at least September that we might be facing a horrible water supply year due to the lack of precipitation during the first 9 months of 2013. Knowing that reservoir levels were getting very low, and that the prior year had insufficient water for fish and water quality standards, the projects simply waited to see what would happen. Not until the very last minute did they file their Urgency Petition." “Urgency Petitions require no public notice or input, but must be based on a finding that the petitioner exercised due diligence in getting the permit change under the normal petition process if possible. Since the projects have known for months that this scenario was facing them, they should have made their petition months ago. But that would have resulted in public notice, public hearing and input by the interests who depend on the current standards being met. Now that the Sacramento River Watershed reservoirs have been drained sights are set on Sac Valley aquifer systems for a "temporary" drawdown of groundwater to meet investor demand in the San Joaquin Valley. AquAlliance is vigilant! This is exactly why the State of Jefferson is needed. Northern California needs to be able to protect its population from such gross mismanagement. and Sales. Why is it Southern California is NOT Effected !!!! In doing a little research this morning I found this article about a bidding war going on for water in the valley...very interesting!